The mysteries of Santorini emerge through the vermillion colours of the astonishing sunsets of the caldera. Mysteries of the sleeping volcano, intoxicating beaches and majestic sunsets compose the rare beauty of this island. The eternal beauty of Santorini is crafted through the reddish cliffs and the colorful houses hanging over the deep blue of the Aegean. 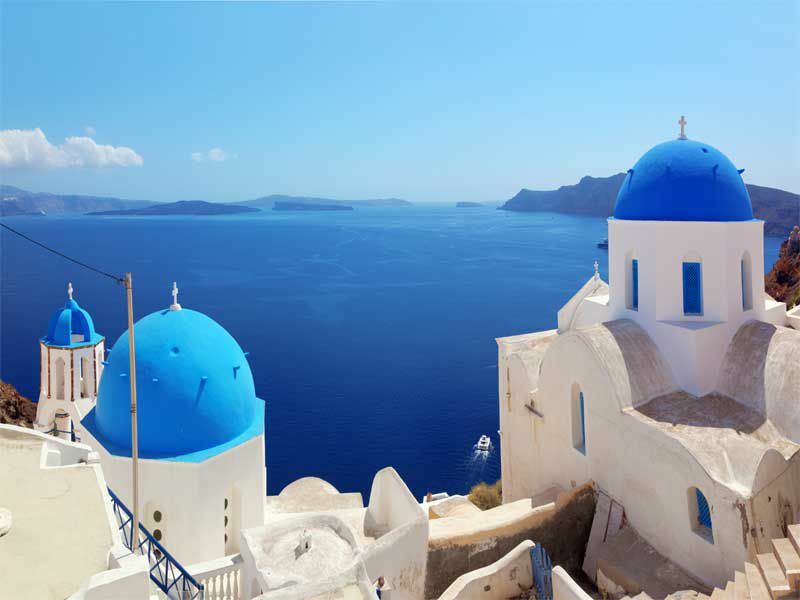 Characterized as one of the most beautiful islands in the world, Santorini will definetely leave you speechless from her invigorating beauty of the imposing sceneries of the island. Nowhere else on earth exist such an impressive scenery hosting human life. As though the works of the almighty volcano create awe, as though the island is exposed in the most imposing landscapes of the world, as though thousands of travellers grasp subtly a piece of her soul, Santorini is a miracle itself. The feeling of permeation to the magic of nature will exceed your expectations by emptying your mind as observing the flawless beauty of the sculptured rock that hangs over the deep blue waters of the Aegean. The explosive identity of this island will travel you to the craggy rocks elegantly carved lava provoking your awe and the thought that the volcano might be still active will inflame your shiver while bathing in the yellowish sulfur waters. From the volcanic sceneries of the caldera and the idiomorphic black sandy beaches to the atmospheric villages and the stunning views of the hinterland, this island hides mythical moments of romance. 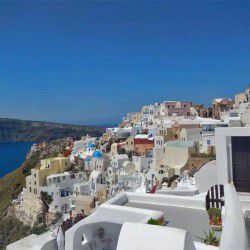 The evocative landscapes, the lunar sceneries and the fascinating history of the island attest that Santorini is a natural monument for your bucket list, a destination you deserve to explore even for once in this life. Although Santorini distinguishes for her evocative and volcanic identity, this island hides other mysteries in her Aegean seashores. From deep blue waters with black, red and white sand to volcanic pebbles, vertical cliffs and spectacular rocky formations, the beaches of Santorini will undoubtedly surprise you with their peculiarity. Indeed, the vertical cliffs that surround some of the beaches and the nature of the sand itself create a surreal setting for swimming. These coastal treasures hide stunning lunar landscapes that have been profoundly influenced from the volcanic nature of Santorini. 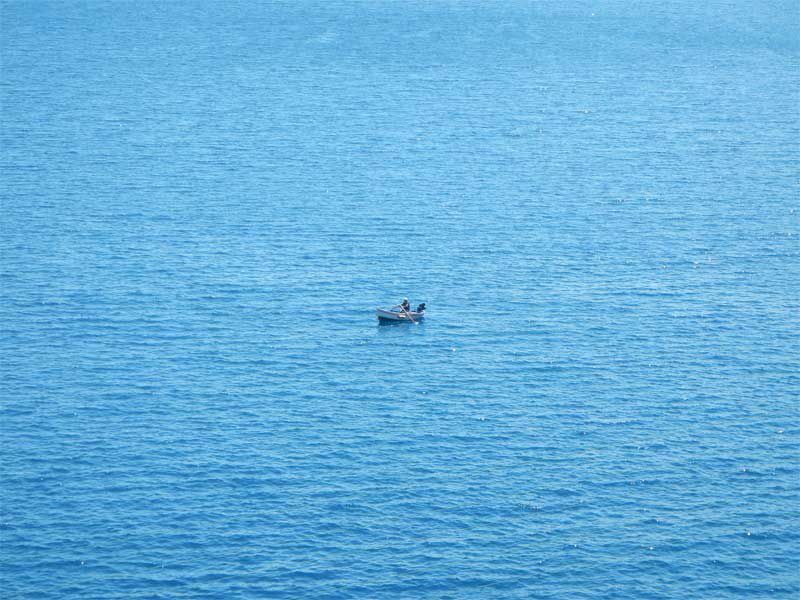 Santorini’s exceptional clarity of the Aegean Sea is hard to find. Don’t predispose yourself for the typical long sandy beaches of Greece, just get ready for the unique natural setting of Santorini’s beaches. In this island, you will not find “just another sandy beach”! Guide yourself to the windswept shores of this island to discover its mysterious and intoxicating beauty! 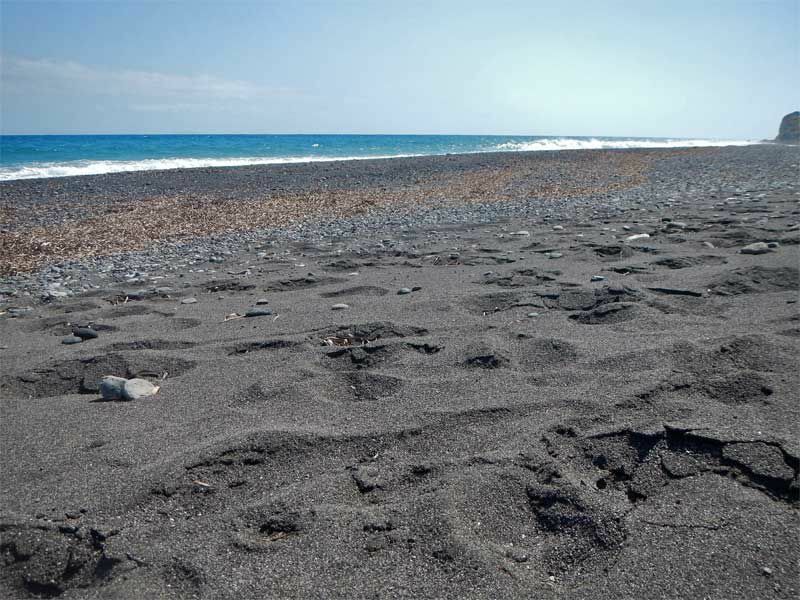 Let’s unveil the mysteries of the beaches of Santorini! The northern part of the island is filled with the sun-drenched beaches of Oia that distinguish for their wild beauty; Ammoudi, the renowned harbour of Oia, Armeni with its azure waters and its stunning views to the island of Thirassia, Baxedes with its blackish rocks, Columbo, the endless black beach with the largest active underwater crater of Santorini, and Katharos with its wild sceneries. The east side of the island is an ideal place for those looking for tranquility and seclusion; impressive sculptured rocks with volcanic pebbles and azure waters will fill you up with moments of great serenity! 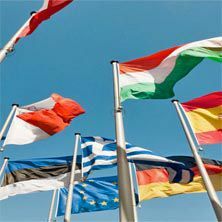 Its trademarks include Exo Gialos, Xiropigado and Vourvoulos. 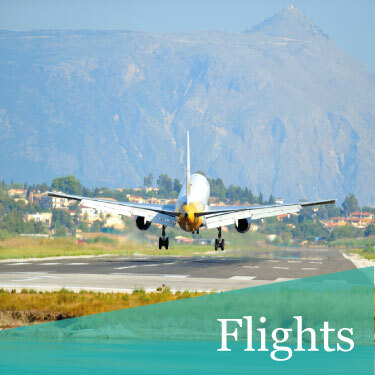 Heading to the southeast part, travellers will get ecstatic from the volcanic black sandy and pebbled beaches; Monolithos with its spectacular rocky formations, Kamari, one of the most organized beaches of Santorini, and Agios Georgios/Perivolos/Perissa, the longest black sandy beach of Santorini with bustling beach bars, diving centers and sophisticated restaurants. On the south part of Santorini, you will find one of the most spectacular beaches of Santorini, Vlychada, which distinguishes for its magnificent lunar landscapes and its greyish sand; it is worth stating that a modern marina has been built to accommodate the Sailing and Yacht Club of Santorini here! 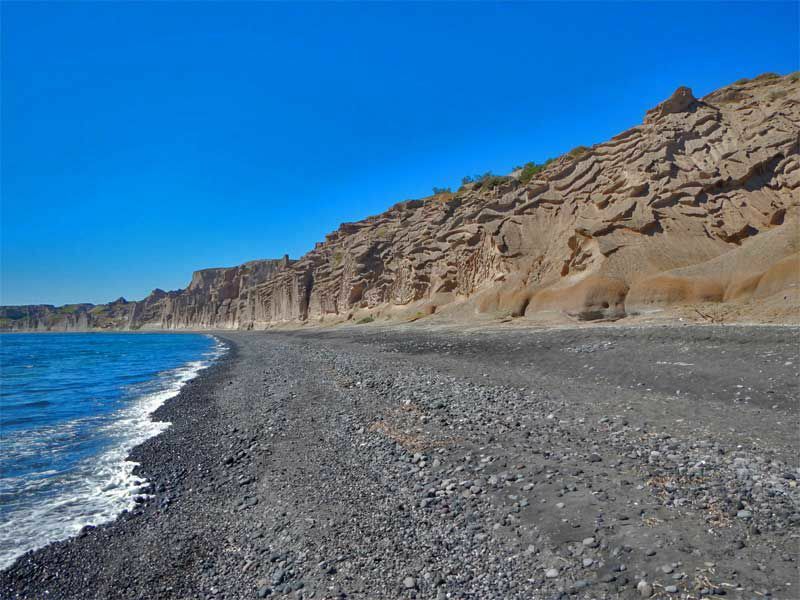 Nearby, sun seekers will also find Almyra, a quiet beach ideal for tranquility, the area of Akrotiri, famous for the ruins of the ancient town but also its wonderful beaches, Caldera with its supreme view of the volcano, and Gialos ideal only for off-road driving lovers. 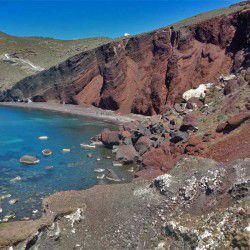 However, the star of Santorini is the Red Beach located just a few meters away from Akrotiri archaeological site; the awe-inspiring volcanic scenery with the penetrating reddish rocks will surely take your breath away! Agios Georgios, one of the most beautiful beaches of Santorini, is the longest beach of the island located on the southern tip of the island. 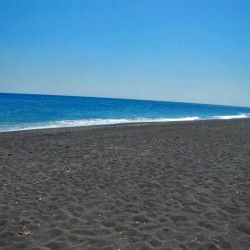 The soft black sand of Agios Georgios in conjunction with the deep blue waters of the Aegean will ultimately revitalize your body and mind. 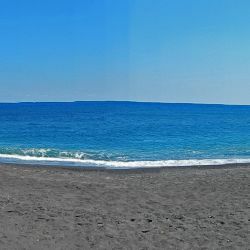 Agios Georgios is not just another typical sandy beach, as it was primarily made from the volcanic nature of Santorini. The beach is well organized for sun-seekers with a wide range of amenities from sunbeds and umbrellas, beach bars and cafeterias, taverns and restaurants, diving centers and water sports facilities. What else you might need? Home to the largest underwater crater of Santorini, Columbo beach is the most isolate spot of the island that will surpass your expectations with its dramatic landscapes and its wild sceneries. 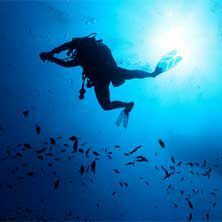 According to volcanologists, this is the most dangerous underwater volcanic region in the Mediterranean. The enormous cliffs and the endless volcanic black sand of Columbo beach near Oia village offer moments of ultimate serenity. Keep in mind you should bring all the necessities with you, as Columbo beach is totally secluded. Make sure to always have your camera with you because the ride to the north part of the island is absolutely beautiful! 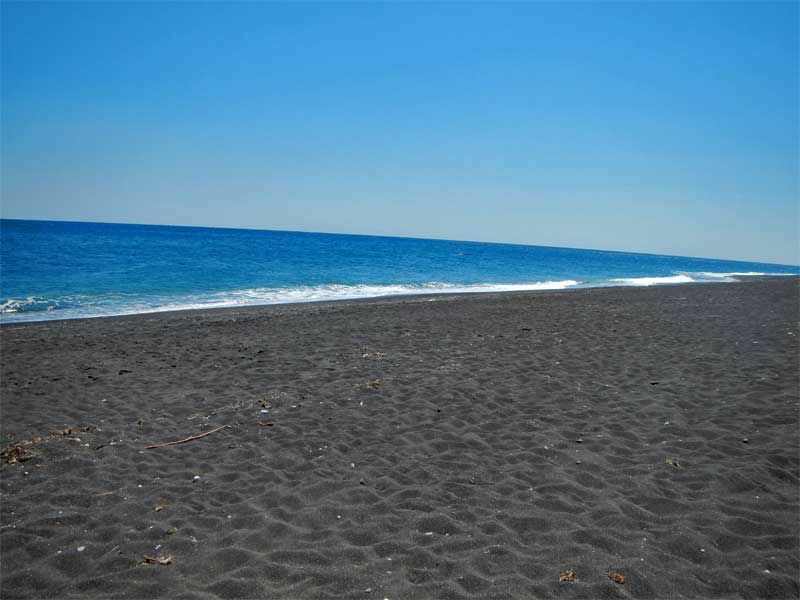 Obscured from the grandeur of Mesa Vouno Mountain, Kamari is one of the longest black sandy beaches of Santorini that has been awarded with the Blue Flag. Although the entire village was destroyed from the massive earthquake of 1956, the area was rebuilt from scratch. Today, Kamari beach is one of the best-organized beaches of the island with a wide range of amenities from sunbeds and umbrellas, beach bars and cafeterias, taverns and restaurants, diving centers and water sports facilities. 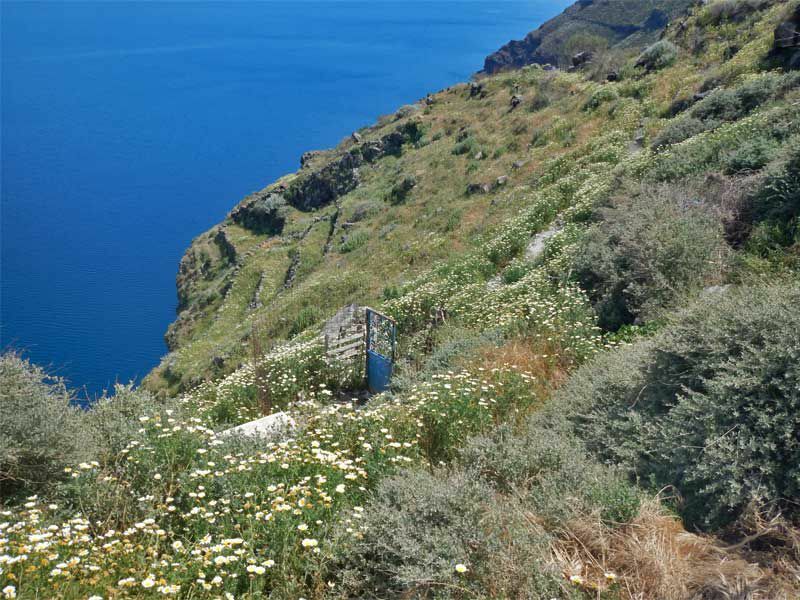 Those who wish to explore the mysterious face of Santorini can hike up to Ancient Thera. 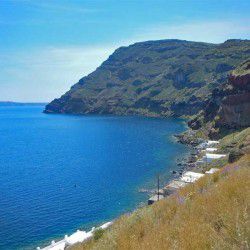 Nestling in the wonderful natural environment of Akrotiri, Mesa Pigadia is one of the most mysterious beaches of Santorini, one of its secret spots that distinguishes for its seclusion and its tranquility.. The sandy and pebbled beach is surrounded from towering white cliffs with a wide range of colourful doors carved into the rock, the renowned cave houses, which used to host fishing boats during the winter. The serenity of Mesa Pigadia beach is quite spectacular; indeed, you will find you peace on this beach. 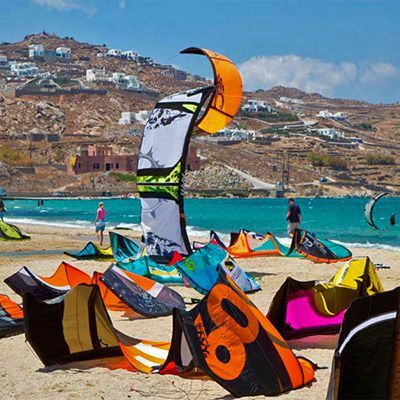 Be advised that the beach can either be reached over a tough dirt track accessible only to 4×4 vehicles or through a short boat trip from Akrotiri. Monolithos is one of the most spectacular beaches of Santorini located on the southeast coastline of Santorini. Deserted to its own distinctive beauty, Monolithos is an endless golden sandy beach surrounded from gigantic whitish cliffs in various shapes and sizes. Although Monolithos is an organized beach, it pays its tributes to the environment making an ideal destination for those looking for relaxation and tranquility. Just behind Monolithos beach, you will find the tomato factory. It is a must to visit the impressive Tomato Factory of Santorini in order to unveil the mysteries of the rich tradition of the island in the harvesting and production of tomatoes. 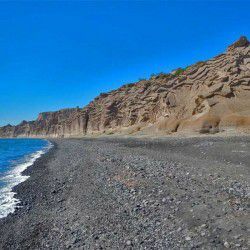 Else known as the black beach due to its volcanic sand, Perivolas is one of the most beautiful beaches of Santorini located on the southern coastline of the island. Distinguishes for its sparking deep blue waters and its relaxing atmosphere, it will be inevitable no to fall in love with Perivolos. 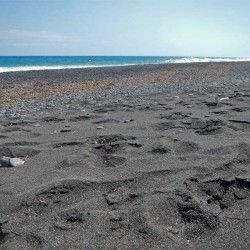 Lay on the hot black sand where you will fill Santorini’s magic in all its grandeur and close your eyes; the feelings will surpass your expectation, a priceless moment! 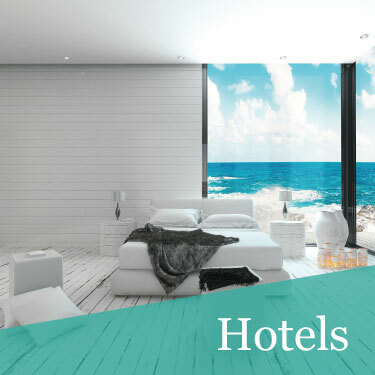 Perivolos is fully organized for sun-seekers with a wide range of amenities from sunbeds and umbrellas, beach bars and cafeterias, taverns and restaurants, diving centers and water sports facilities. What else you might need? 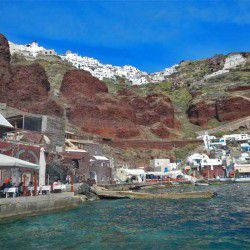 The Red Beach of Santorini, the shining star of this island, which is worldwide famous for its reddish grandeur; undeniably, the Red Beach will capture your attention instantly. 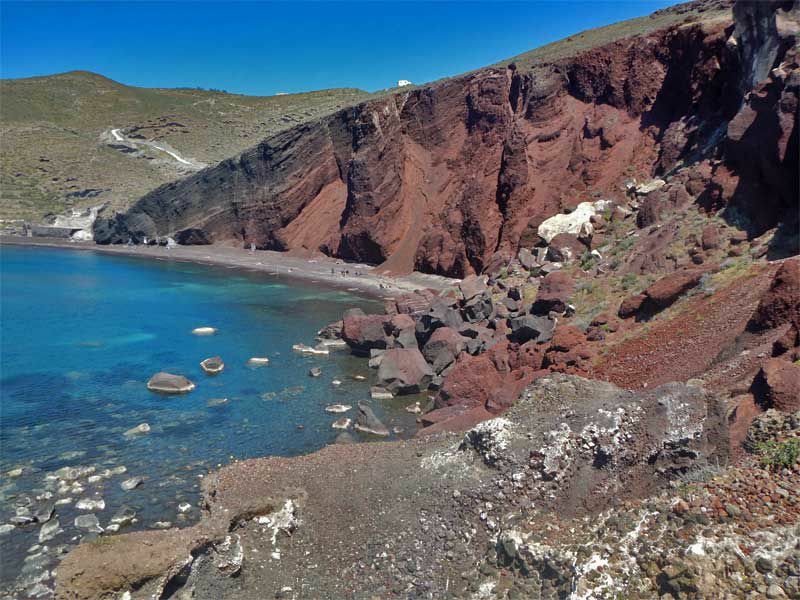 Nowhere in the world there is such impressive sceneries hosting human life, and the Red Beach is one of these spectacular landscapes of Santorini. Conquered from its towering red cliffs, this natural monument will make you want to stay there forever. However, keep in mind that high season in Santorini equals to an over-crowded atmosphere; so, you better choose the time your visit wisely! Make sure you get some fresh fruits from the grocery before the path to the Red Beach! The latest and greatest; Vlychada it is! Resembling monsters that invade to the sea, it is definite that the towering cliffs of Vlychada beach is a unique natural monument ideal for photography explorations. Peculiar shapes and gigantic sizes of cliffs and rocky formations will make you think you just visited a movie setting of a science fiction movie. An endless black sandy beach invites you to dive into the crystalline blue waters of hers to enjoy moments of ultimate relaxation. Will you be able to resist? Mysterious, speechless, beautiful, invigorating, spectacular, intoxicating … however you characterize her, Santorini will astonish you with her flawless beauties. 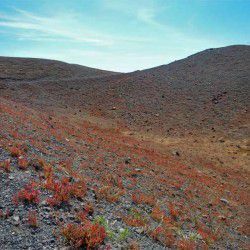 Known as the island of lava, this island of the Cyclades is worldwide known for her marvelous sunsets. Santorini holds the reigns of the island the sunsets where all the shades of orange, red and yellow unveil their shades in the sky in the most mysterious way; a unique spectacle of nature! As author Giorgos Seferis has said “…we found ourselves naked upon the pumice stones, watching the rising islands, watching the red islands sinking into their sleep, in our sleep…” Can you let your imagination envision the indescribable beauty of the sunsets you will encounter in Santorini? Conquered from the reddish cliffs, the harbour of Ammoudi is undoubtedly one of the most popular sunset spots in Santorini. However, the castle and the windmills of Oia are the places to be if you want to enjoy the most romantic sunset of your life. Keep in mind, though, that the best season to watch the sunset from any spot in Oia is the off-season, as the most beautiful village of Santorini gets crowded with sun kissed lovers in the summer. The chapel of Agios Georgios stands on the highest point of Imerovigli, and from there, you will have the opportunity to admire an intoxicating sunset. The cameras are battling to capture the memory from the sunsets of Santorini. Shut, shut, and shut! Are you ready to capture your own photographs on the island of lava? Lighthouse of Akrotiri: Extravagant Sunset Views The lighthouse of Akrotiri is one of the most secluded sunset spots; if you are looking for a more intimate location to watch sunset with glimpses of your eyes, the view to the violet sky before the nightfall from the lighthouse will amaze you. Although the crowds seem to overlook the lighthouse of Akrotiri as a sunset spot due to the shining glory of Oia, the view from Akrotiri’s lighthouse will fill you moments of ultimate romance. Other than the glorious beaches and the natural wonders of this island, Santorini has much to offer. 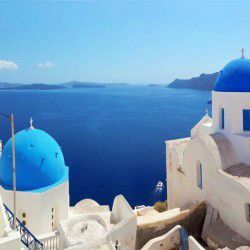 From historical monuments of great importance and impregnable castles dominating the islands’ peaks to glorious churches with magnificent blue domes and interesting galleries with rich collections, Santorini will surprise you with its unrevealed mysteries. 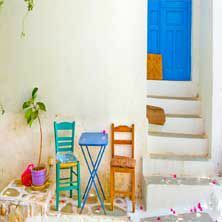 On the southeastern arc of the Cyclades, Santorini impresses with its individuality. 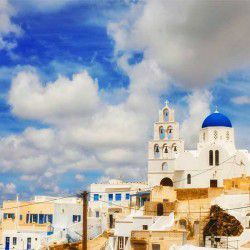 Whether you desire to broaden you knowledge of the ancient Greek culture by visiting magnificent archaeological sites or you want to find your spiritual comfort in glorious churches and monasteries, or even if you want to visit spectacular one-of-a-kind museums, you will find everything on the island of Santorini! 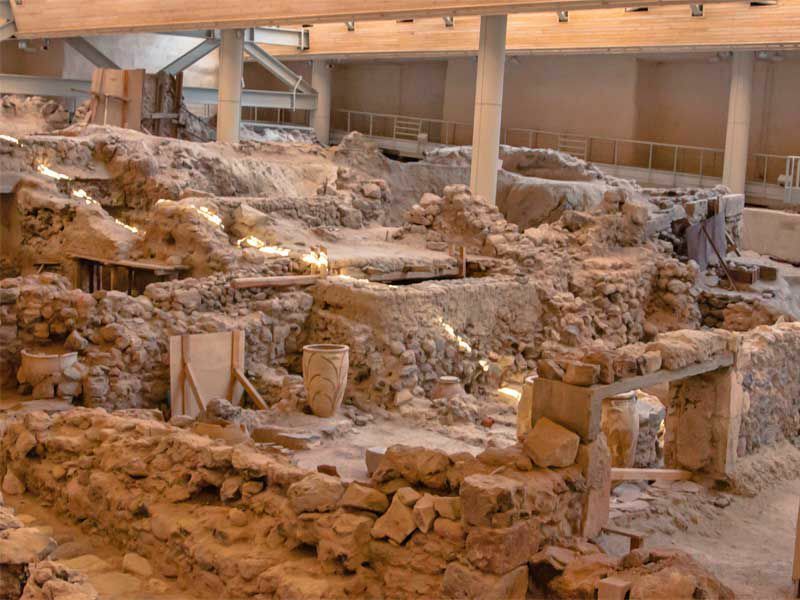 Since the first inhabitation of Strogili and the establishment of the first prehistoric settlements, Santorini has become a haven for archaeology enthusiasts and history lovers. Whether you choose to visit the archaeological site of Akrotiri or the town of Ancient Thera, the archaeology of Santorini will thrill you! 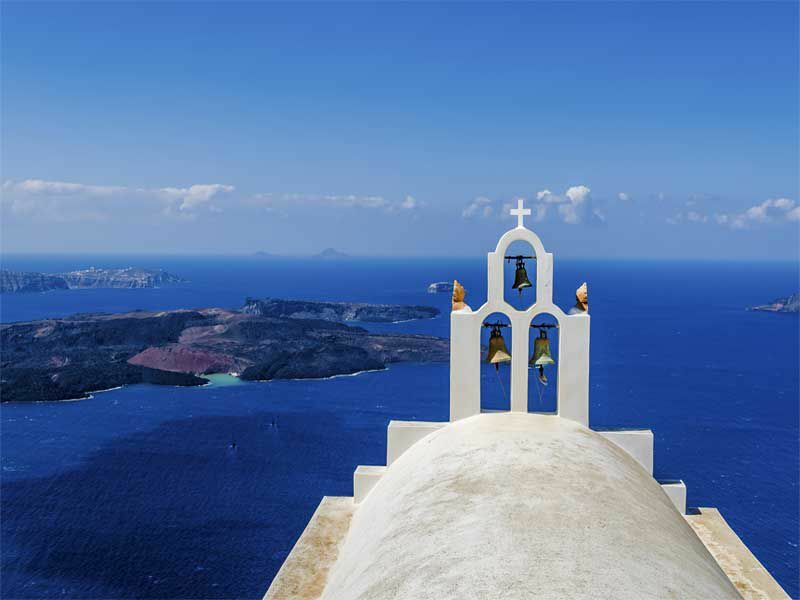 Undeniably, the blue-domed churches of Santorini are most distinctive image of this island. The religious dedication of the locals was strengthened from the catastrophic earthquakes and the volcanic eruption that shattered the island! 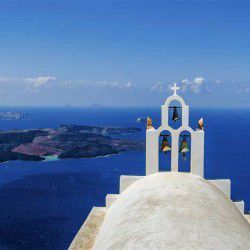 Indeed, Santorini boasts more than 250 churches that distinguish for their whitewashed walls, their blue domes and their twin bell towers. The Orthodox Metropolitan Church of Santorini is one of the most spectacular churches of the island, if not the Cyclades, which distinguishes for its wonderful architectural form. The church was constructed in 1827 until its renovation following the catastrophic earthquake of 1956. Santorini’s Orthodox Cathedral distinguishes for its impressive wall paintings made from the local artist Christoforos Assimis, its elegant arches and arcades and its wonderful bell tower. Its true jewel, however, are the magnificent views over the famous caldera of Santorini! 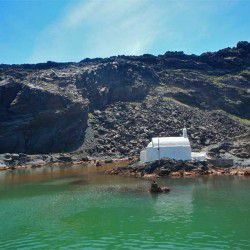 Two hundred meters up on the slopes of Mesa Vouno lies the tiny charming chapel of Panagia Katefiani on the southeast coast of Santorini. 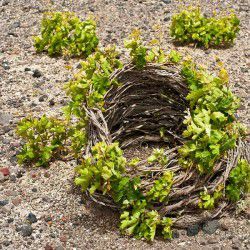 Its name derives from the Greek word katafigio aka refugee, as the local inhabitant used to hide there in times of hostile attacks. 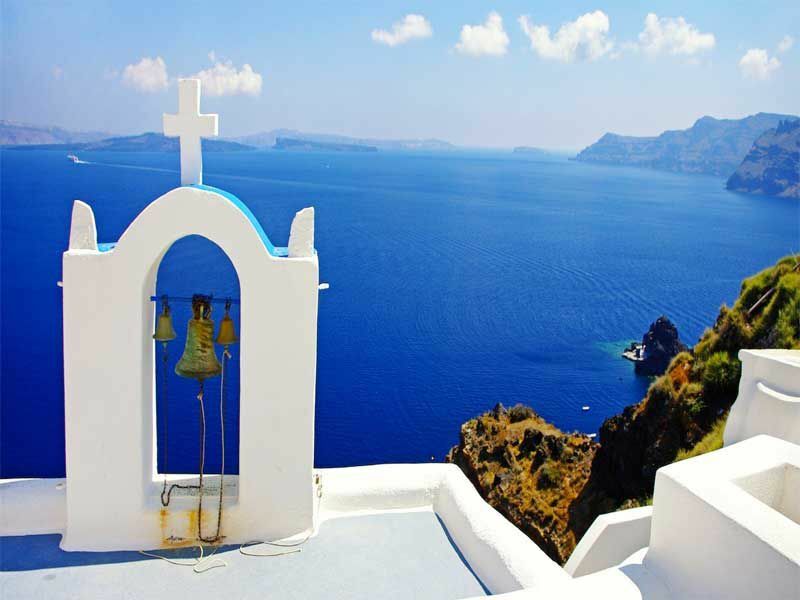 The chapel provides breathtaking views to the Aegean Sea. It is worth noting that its celebration takes place on September 8 in honor of the birthday of Virgin Mary. 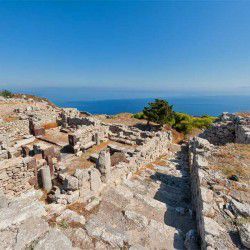 If you wish to visit the chapel, you ought to follow the trail from Perissa leading to the archaeological site of Ancient Thera. The views will feel you up with moments of absolute serenity. The king of the religious monuments of Santorini stands on the highest spot of the island at an altitude of 567 meters above the sea level. The monastery is one of the oldest fortified monasteries of Santorini that was constructed in 1712. Prophet Elias Monastery used to owe a ship during the 18th century, which carried out business with the Aegean and the Mediterranean that helped in its development. The monastery used to run a school where the Greek language was taught. However, its decline started following the devastating earthquakes of 1956. Prophet Elias Monastery is currently inhabited from six monks engaged in grape harvesting and olive making other than their religious life. Within the premises of the monastery, you will also find an ecclesiastical museum with an interesting collection of hagiographies, wooden sculptures, metal artworks and embroidery that date back to the 17th century. It also has workshops on candle making, printing and shoemaking. 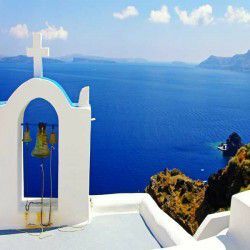 Make sure to pay a visit to the tiny chapel of Agios Nektarios and its courtyard for the breathtaking views over the entire island of Santorini. 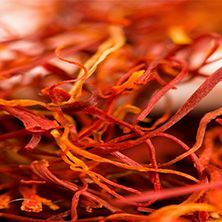 There, you will also find the shop of the monastery with the exceptional olive oil and wine made from the monks. 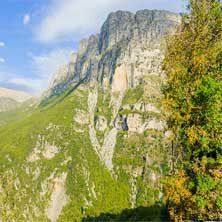 If you are an adventurer, the location of the monastery is offered for trekking enthusiasts. Prophet Elias Monastery is a must visit; you will definitely be amazed from the wonderful driving route from Pyrgos village up to the monastery! Even if you are in the travel mood of visiting galleries and museums, it is certain that Santorini will surprise you with its collections. From one-of-a-kind museums including the underground wine museum of Koutsoyannopoulos and the tomato factory museum to distinctive museums with valuable findings such as the prehistoric museum of Thera and the maritime museum of Oia and precious collections of folklore tradition as Argyros Mansion, Santorini has it for you! One of the biggest disasters in mankind, the Minoan eruption, created some of the most astonishing sceneries in the middle of the Aegean Sea. Barren landscapes engraved from magma illuminate one of the most beautiful islands of Greece. This is Santorini. From the barren sceneries of Palea and Nea Kameni carved with lava and pumice stones and the endless volcanic black sandy beaches of Agios Georgios and Perivolos to the reddish cliffs of the world-renowned Red beach and the gigantic rocks that resemble monsters that invade to the sea in Vlychada beach to the hanging houses of Fira, Imerovigli, Firostefani and Oia, the wildernesses of the lighthouse in Akrotiri and the sea lilies blooming that the beaches during the summer, Santorini fascinates even the most creative minds. Wherever you go in Santorini, Mother Nature will allure your body and soul. Daisies blooming everywhere in the spring, from the meadows with the whitish and the brownish horses to the volcanic grounds of the eastern shores! 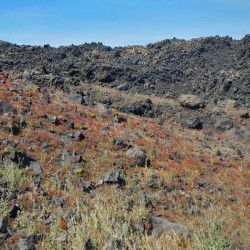 Even in Nea Kameni, on your way up to the crater, you will see millions of colours that will make you wonder how nature can be so beautiful in such a volcanic soil. Under the spirit of the summer, its arid and dry landscapes, luckily, are freshened up from the cool breezes. Whether you choose to dive into the crystalline waters of the sea, even near the largest underwater crater of Columbo, one of the finest beaches of Santorini, it is definite that this island is will fill you up with moments of ultimate relaxation. 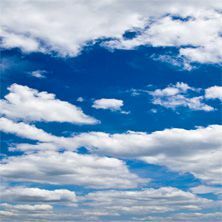 Even in the winter, when the weather is cold and windy, the sceneries of Santorini are to die for, absolutely fabulous! 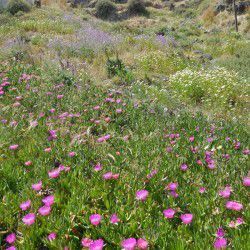 Hiking enthusiast or trekking lover, the best way to explore all the aspects of nature in Santorini is undeniably by foot. Tie your shoes, grasp your camera, wear your sunscreen and bring you sunglasses to unveil the mysteries of Santorini! 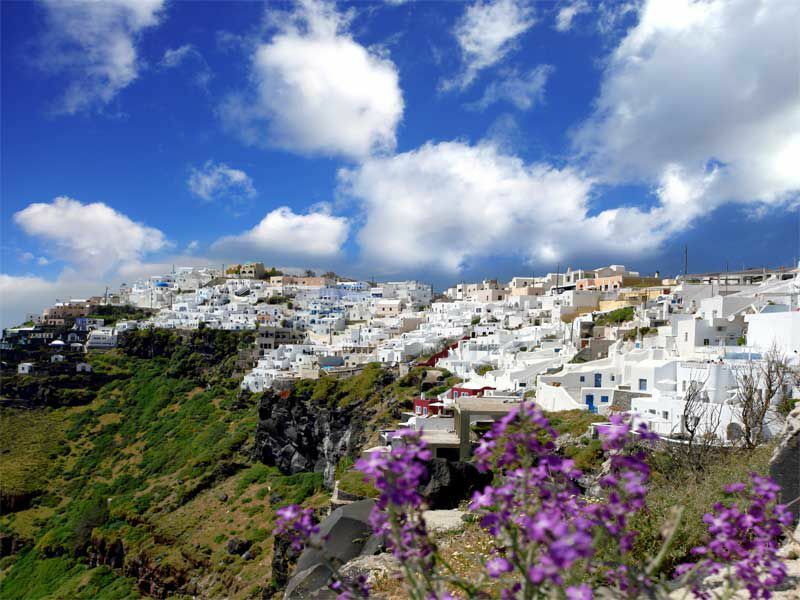 The gem of the Caldera, Thirassia, lies not even a mile away from the romantic settlement of Oia. When you arrive on Thirassia, you will feel like you stepped back in another bygone era. Strange how time and distance can play with your mind. 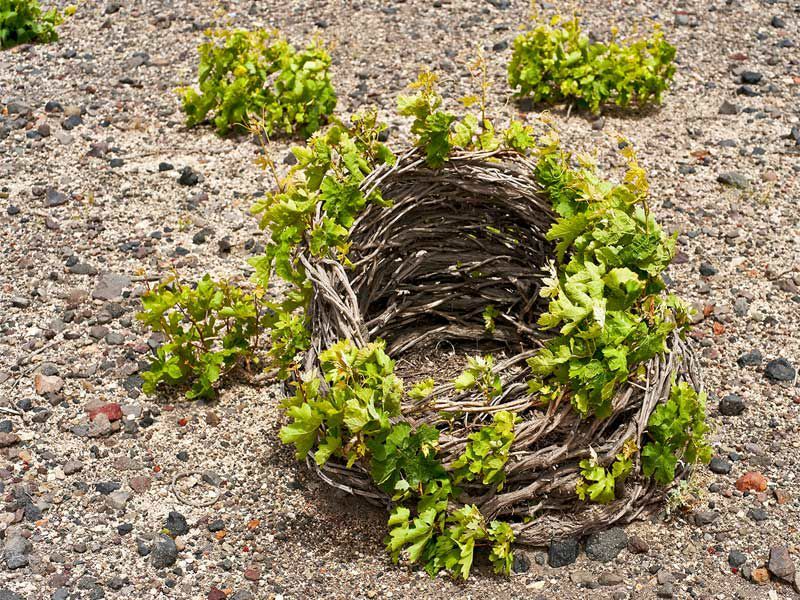 Old men playing backgammon, fishermen putting their tools in their boats and old ladies suffuse the clothes on the hangers are some of the simple images you will encounter on this tiny island. 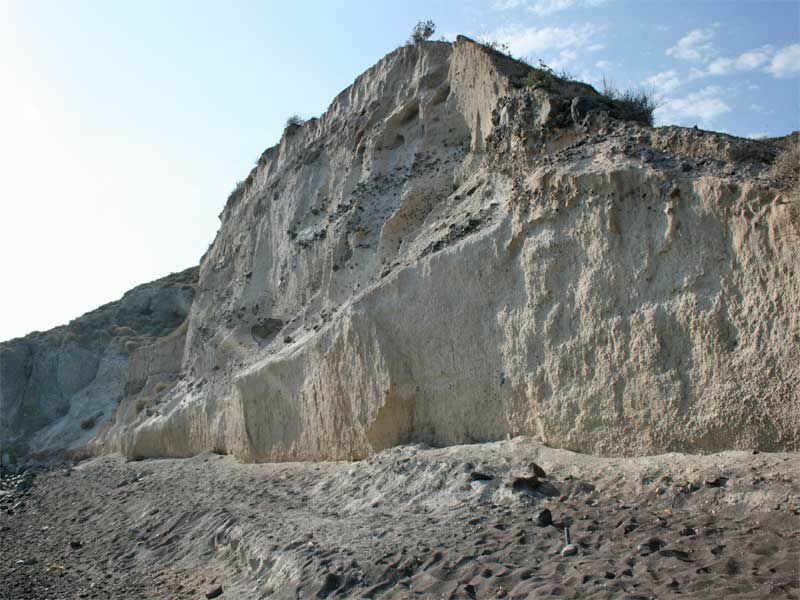 Sometimes, size does not play a crucial role; besides, what Thirasia might lack in size, it replenishes in sceneries, as it constitutes the remnants of the great volcanic explosion of the Aegean. The imposing natural terrain with the impressive geological formations, the folklore traditional architecture of the settlement and the authentic traditional colors of the village of Manolas along with the black beach of Korfos compose the spectacular beauty of this volcanic isle. Undeniably, Thirasia will leave you speechless as you climb to the highest point of hers. From the settlement of Manolas that seems like a scenery of science fiction brought from the 1960s, the volcanic veins of the volcano of Santorini on the southern part of Thirassia, the chapel of Santa Irene, from which the Venetians gave the name to the entire island of Santorini following the Fourth Crusade in 1204, to the monastery of Panagia with its spectacular views over the caldera, the vineyards, tomato plants and fava beans of the western valley and the abandoned settlement of Kera with the ruined houses, it is definite that Thirasia is an island far from the ordinary. An imposing natural monument unfolds in your eyes and it grasps your attention without even trying! 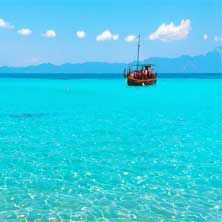 The unspoilt beauty of Thirasia will seduce you with the whitewashed houses that are scattered on the wild beauty of the black earth of the volcano. Will you let her seduce you? Since the depths of time, Santorini was always recognised for her evocative character, her invigorating sceneries and her intoxicating sunsets; all of these were the result of the eruption of Thera, also known as the Minoan eruption, a major catastrophic volcanic eruption that took place in the second half of the 2nd millennium BC. Characterised as one of the largest volcanic events on earth in recorded history, the eruption devastated the island of Thera. 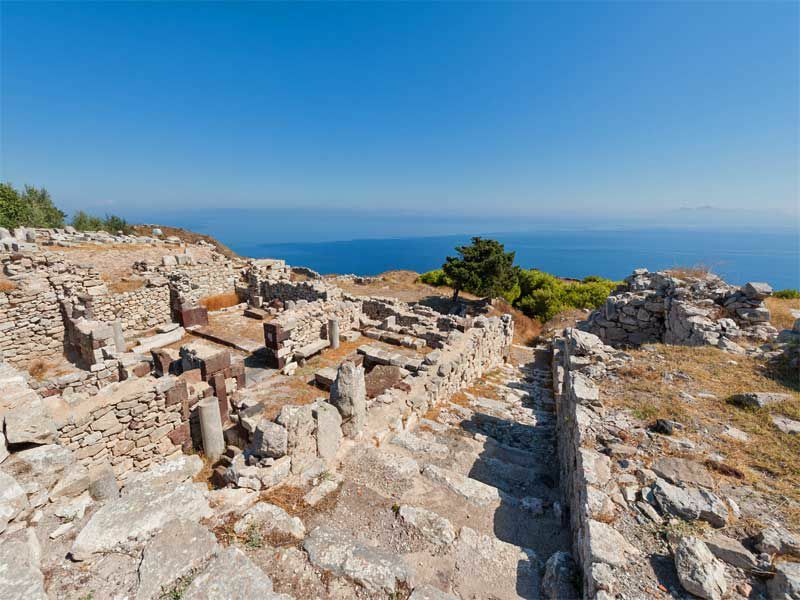 The eruption caused huge tidal waves that destroyed the Minoan civilization of Crete located seventy miles to the southern part from the island. 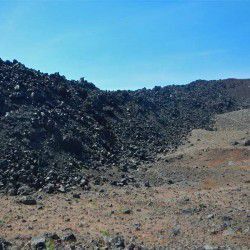 However, geologists have uncovered traces of this eruption as far as Anafi, Lemnos, Paros, Samothrace as well as the Nile Delta in Egypt. 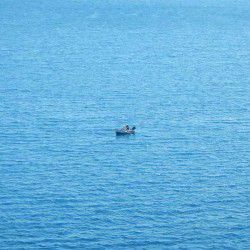 It’s no wonder why Santorini’s name has been recognized worldwide as one of the most beautiful places on earth; however, most of the people ignore the fact that Santorini refers to the tiny island complex that comprises from Aspronisi, Nea Kameni, Palea Kameni, Thera and Thirassia, of which only two are inhabited. 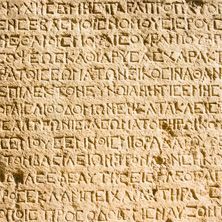 It is worth stating that the official name of Thera was Strongili, which actually means circular in Greek. These five islands were created as a result of this major volcanic eruption. 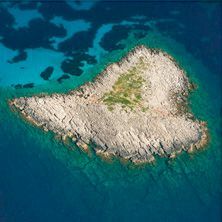 The Minoan eruption changed dramatically the geology of the island, as it used to have the shape of an almost complete ring enclosed from a shallower caldera before the eruption. 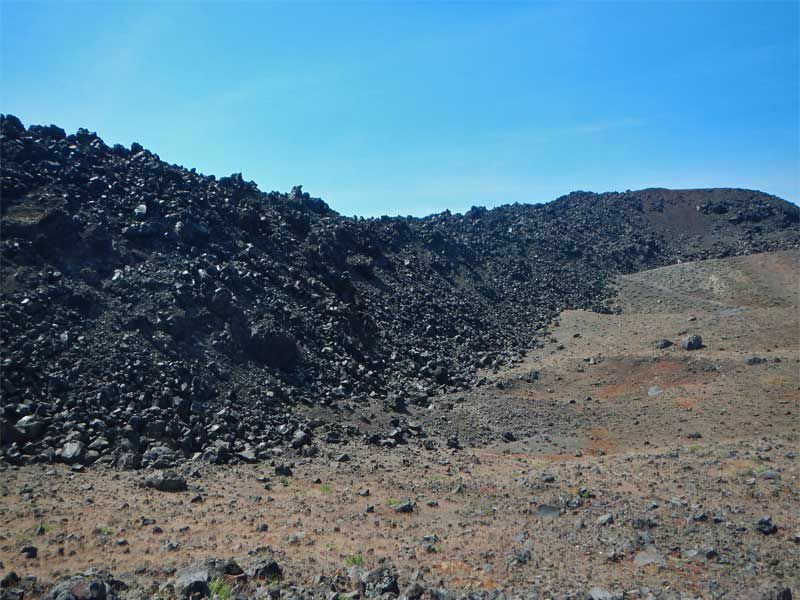 Huge sections of the island collapsed into the emptied magma after the eruption when the caldera was significantly deepened and widened. 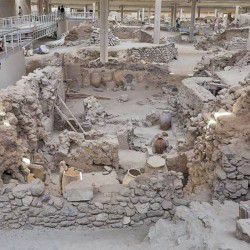 However, the Minoan eruption also devastated significantly the economic center that Santorini was at that time; archaeological excavations brought to light an important Cycladic and Minoan town that that was buried beneath the volcanic ash for approximately four thousands years. 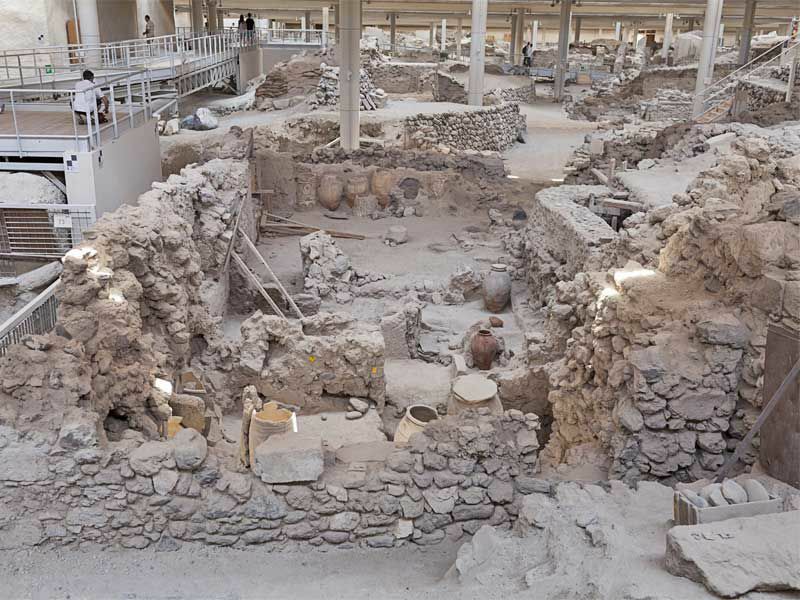 Although it appears that people evacuated the island before the eruption, the findings in Akrotiri are quite impressive. 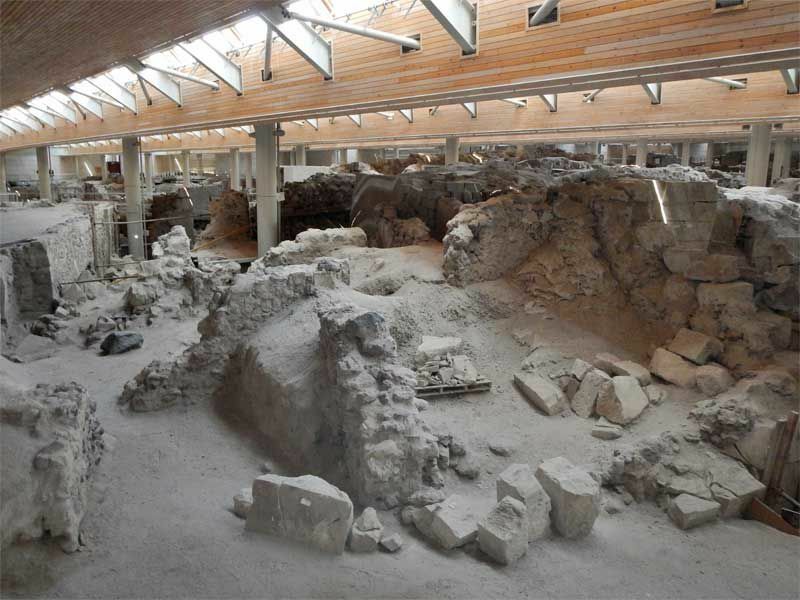 This spectacular archaeological discovery has induced speculations that even relate the legend of the sunken Atlantis with the volcanic destruction of Santorini. 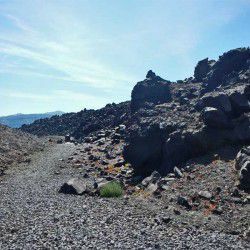 Hiking in an active volcano is undoubtedly an experience of a lifetime. 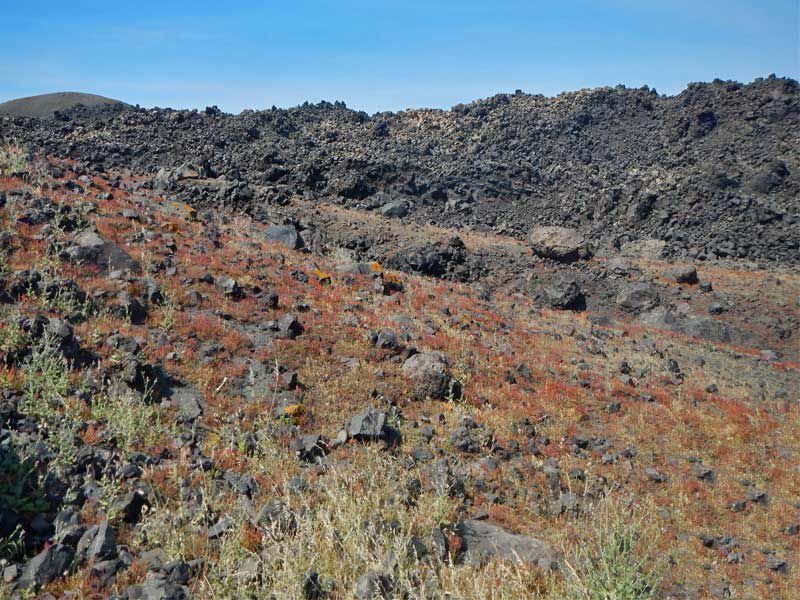 Can you imagine exploring the youngest volcanic crater in the world? 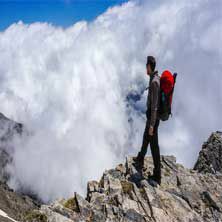 Undoubtedly, hiking in the active volcano of Santorini is a bullet point for your bucket list, as it combines the most exciting elements of this island of the Cyclades; from sailing to the volcano and walking to the active crater to capturing images with your camera and visiting the thermal springs! And the journey begins! Starting from Fira, follow the cobblestone path that leads to the peculiar cliffs of the old harbour. 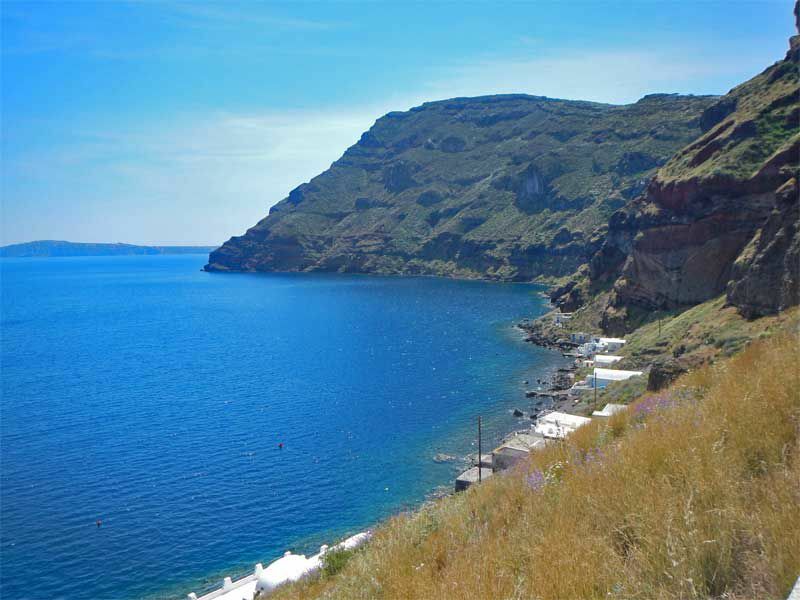 It is one of the most spectacular routes of Santorini with astonishing views to the surrounding area. 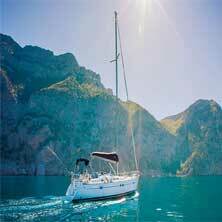 When you arrive at the port, pick you boat to sail your winds across the caldera and the volcano of Nea Kameni. Make sure you have your camera with you! An outstanding hike up over this dormant mountain is challenging enough; though it worth the effort for the breathtaking views. Its just twenty minutes for observing the almighty beauty of Santorini! 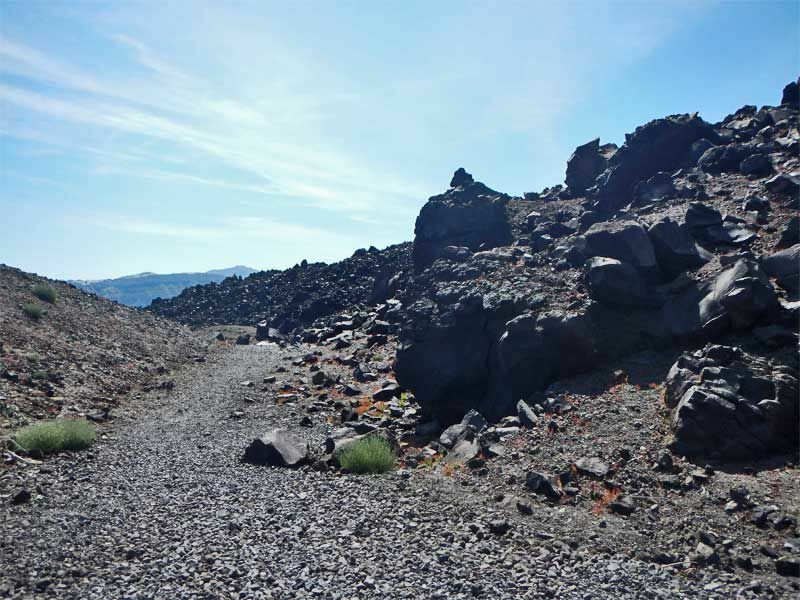 Whether you choose to follow your guide or you decide to explore the volcano by yourself, it will be thrilling. Reaching the top, a miraculous 360-degree view of the entire island of Santorini emerges from every point of the caldera challenging you to choose which of all is the best. A mixture of brown, red and yellow colours arise all around the volcano creating an inimitable canvas of an unknown, yet legendary, artist, none other than Mother Nature. Even if you have heard or read all about hiking to the volcano of Santorini, the feeling of experiencing it for yourself is one-of-a-kind. Santorini thrives in its own distinctive manner! 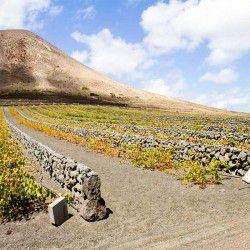 The vineyard of Thera is considered to be one of the most peculiar in the entire planet. 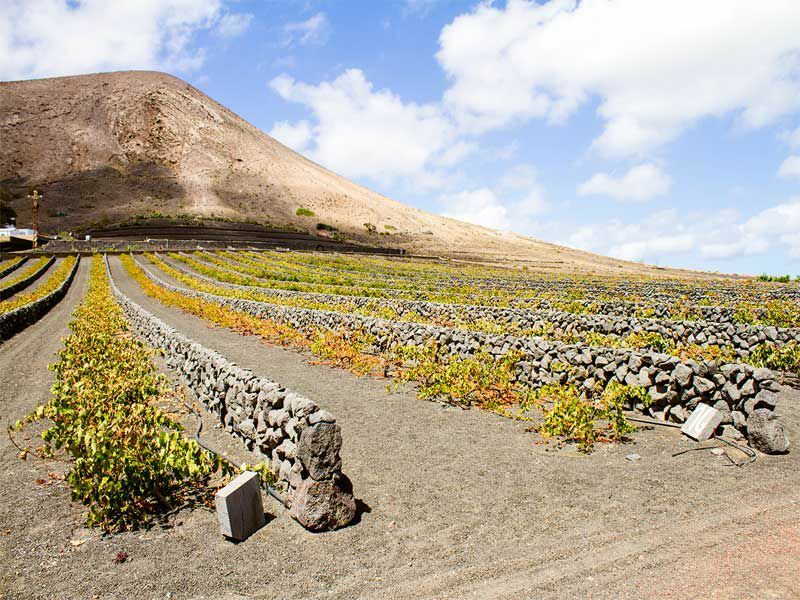 Can you imagine harvesting grapes in such a volcanic soil, where one of the largest volcanic events on earth in recorded history took place? 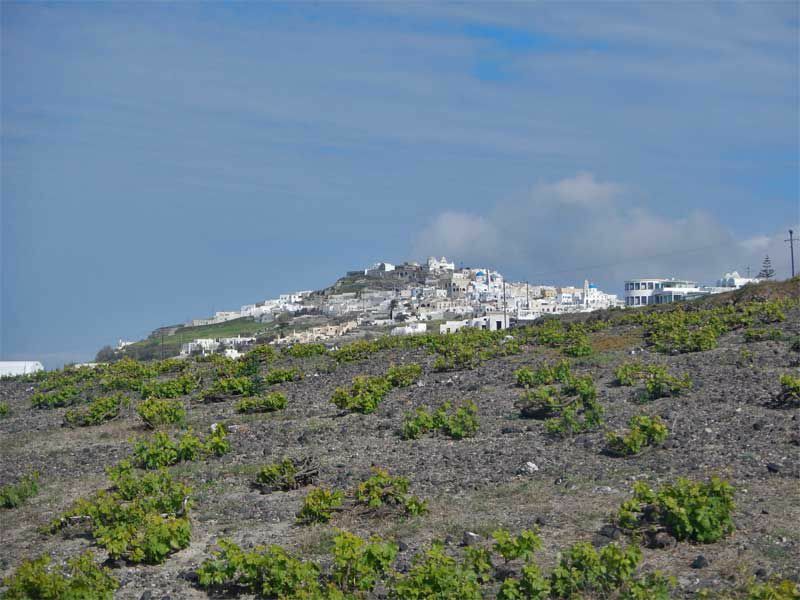 Indeed, the wines of Santorini distinguish worldwide for its smell and taste. 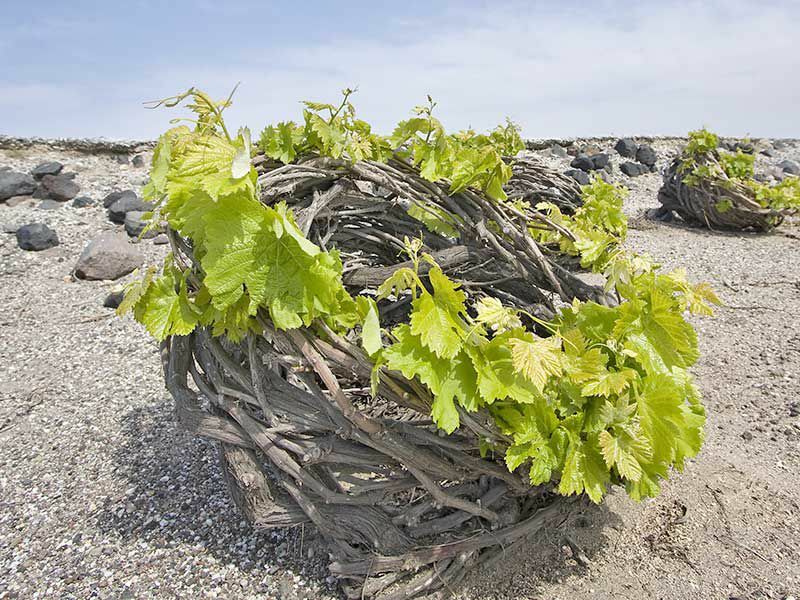 The vines of Santorini flourish, as they withstands drought and its roots penetrate the Theran land. The vineyards of Santorini have played an important role in the life of the island, since their production exceeded the needs of the population, thus exporting it in collaboration with the rich shipping industry of the island, and creating a unique advantage on the island’s economy on its heyday. 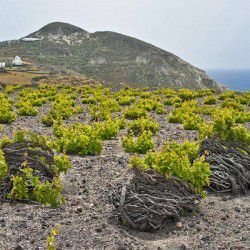 The local grape varieties produce wines of high quality that withstand the distinctive ecosystem of Santorini, as the cultivated region begins at a height of 300 meters whose vines go all the way down to the sea level. 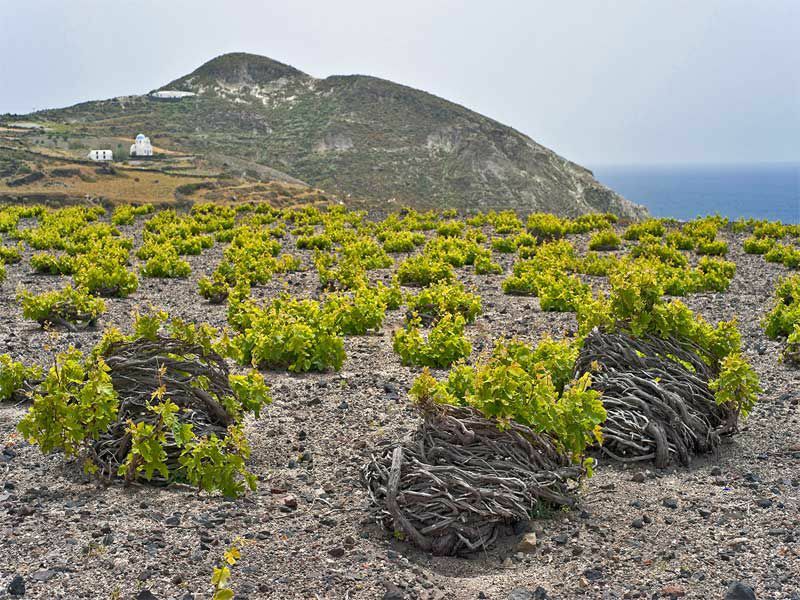 The varieties of Santorini include the white Asyrtiko, the best known variety of the Mediterranean grapevine, the red Mandilaria and Mavrotragano, the sweet red award-winning Vinsanto, produced from Aidani and Asyrtiko then harvest and aged in wooden vats, and the traditional Nykteri made with three white grape varieties including white Asyrtiko, gentle Athiri and aromatic Aidani. Quite interesting are the Santorinian kanaves, the old wineries where vinedressers used to cultivate their vineyards. Wineries used to be rock-hewn underground. 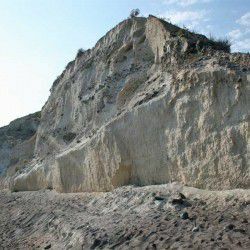 And because watching is better than reading, you can discover some of these old kanaves in the villages of Episkopi, Exo Gonia, Perivolas in Oia and Finikia. 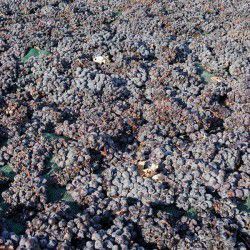 The origins of the vineyards of Santorini are ancient enough, since excavations in the prehistoric settlement of Akrotiri reveal that grapes were grown on the Theran land since the 17th century BC. In fact, wine making and wine trade were crucial activities for the inhabitants at that time. 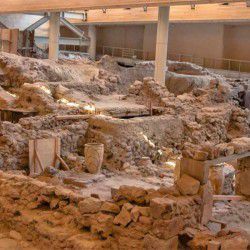 However, the prehistoric vineyard was destroyed from the Minoan eruption in 1600 BC. 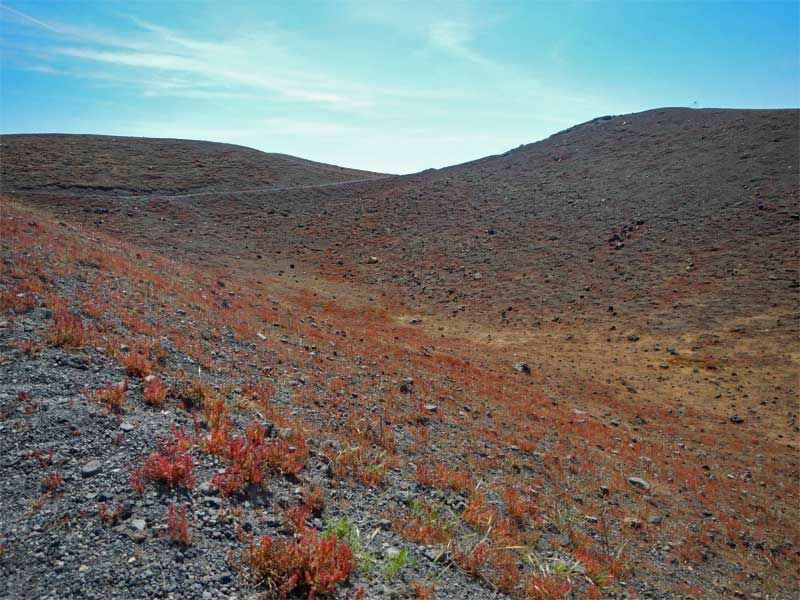 The Phoenicians, the first colonists of Santorini following the devastating disaster, cultivated various plants according to Herodotus, but only vines managed to survive over the centuries. 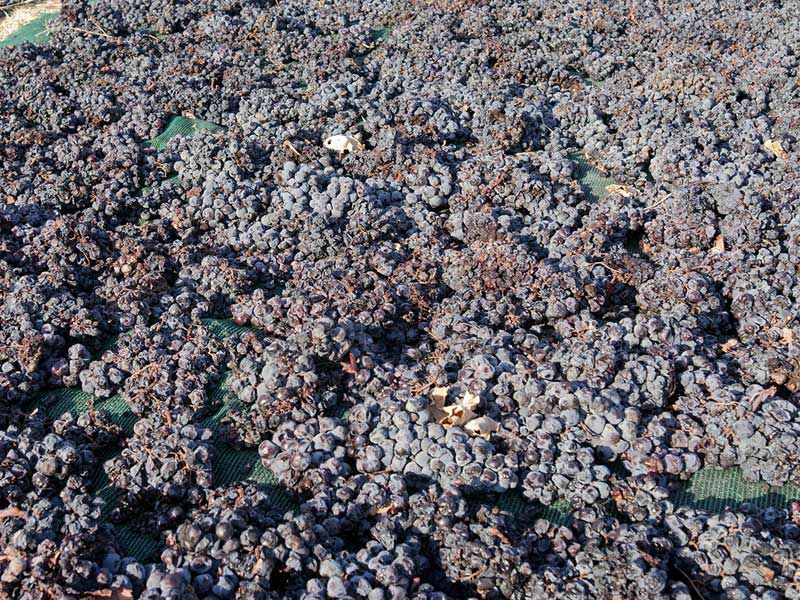 One could say that the vinedressers of Santorini have been cultivating vineyards for more than 3.200 years! A quite impressive fact about its vineyards is the ancient pruning technique; the vinedressers adopted a primitive pruning technique, the so-called kouloura, to limit their need for water and protect plants from strong winds. 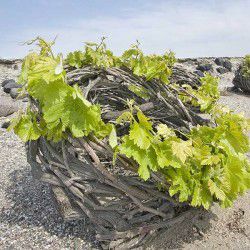 The plants are pruned to form a low vegetable basket where grapes are protected and mature without the risk of being damaged fro the sand and wind. Today, the vineyards of Santorini are tone of the few self-rooted vineyards of Europe! If you really want to discover more information about the wine of Santorini, you can visit the underground Koutsoyannopoulos Wine Museum to discover the entire history of wine making of Santorini. Undeniably, Santorini excites with her bewildering architecture. From whitewashed houses hanging over the rising cliffs on the edge of the caldera and the traditional houses of the Cyclades and the cave rock-hewn houses of Santorini to the neoclassical mansions of the 19th century and the medieval houses dating back to the Venetian occupation, definitely Santorini has an impressive architectural puzzle waiting to be discovered! Whichever village you choose to explore, you will definitely find something memorable to capture with your camera; the stunning sunset of Oia, the traditional houses of Karterados, the cliff-perched views to the volcano from Firostefani, the medieval character of Emborio and the panoramic views from Pyrgos! Let the exploration begin! Holding the reigns of the largest settlement of Santorini, the picturesque village of Emborios nestles on the mountain slopes of Prophet Elias. Once the commercial center of Santorini during the Venetian occupation, the village owes its name to its history, as Emborio is the Greek word for trade. The remnants of Goulas castle and the monument of Kasteli attest the past days of its economic prosperity. Goulas is actually a square medieval castle in the entrance of the village while Kasteli belongs to the type of the fortified settlements of the Venetians. Distinguished for its medieval character, the charming settlement has managed to preserve its authentic spirit. The tiny-whitewashed houses carved in the rocks and the narrow cobblestone alleys compose a distinctive architectural style illustrating Emborio glorious past. Make sure to visit the row of the eight windmills of the 19th century on Gavrilos hill where you will also find the chapel of Prophet Elias that provides spectacular views to the Aegean Sea! If you happen to visit Emborios in October, keep in mind that the locals celebrate Saint Averkios, Santorini’s saint protector of wine and kanaves, on October 22 through a big festival! Undoubtedly, it would be a wonderful experience on Santorini far away from the ordinary! 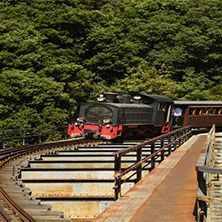 Indulge a fascinating journey in time and explore the mysteries of Emborio! 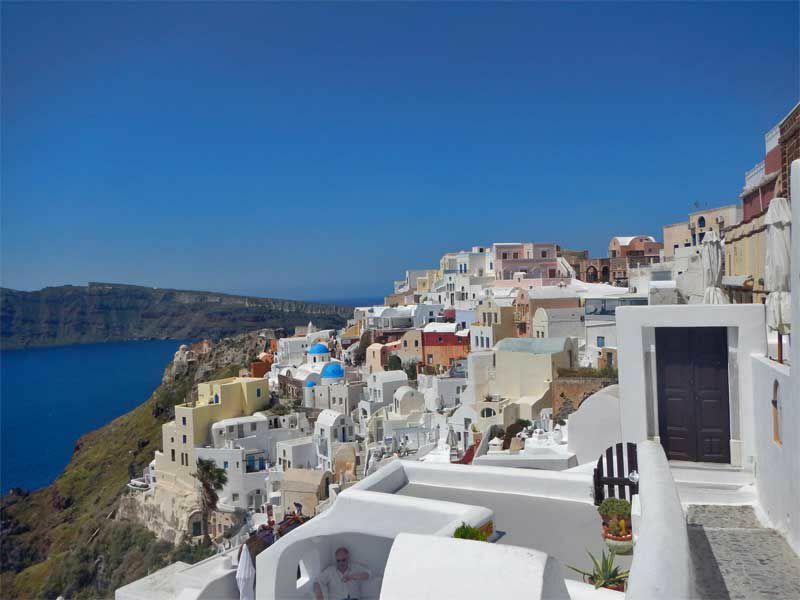 Whitewashed houses hanging over the dramatic cliffs on the edge of the caldera form the triangle power of Santorini. Fira, the capital of Santorini, adheres to the verge of the crags three hundred meters above the sea level on the western side of the island. Five hundred and twenty five steps from the old post of Fira, your eyes will be shining from the village’s glorious sparkle as you see it from the port. 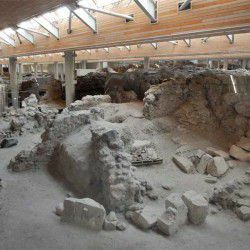 Although Fira is the cultural and commercial center of Santorini, it is worth taking a promenade around its narrow cobblestone alleyways so that you can visit the Museum of Prehistoric Thera along with the Archaeological Museum of Santorini. 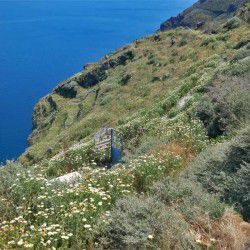 From Fira, you can follow the most beautiful hiking route of the island that passes from Firostefani and Imerovigli till the romantic settlement of Oia! 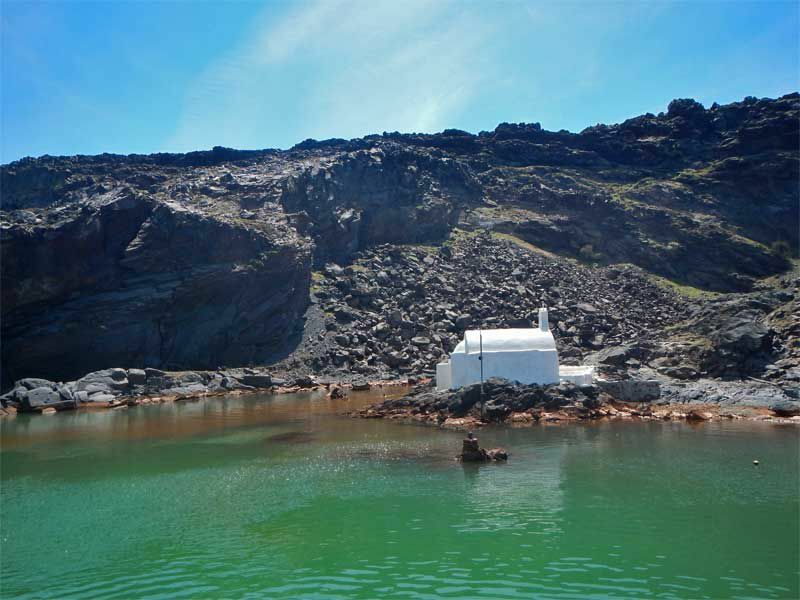 Here, you can also hop into the cable car to reach the old port in order to visit the spectacular volcanic isles of Palea and Nea Kameni with a short boat trip! The crown of Fira, aka Firostefani, is the continuation of Fira famous for the stunning view to the caldera. 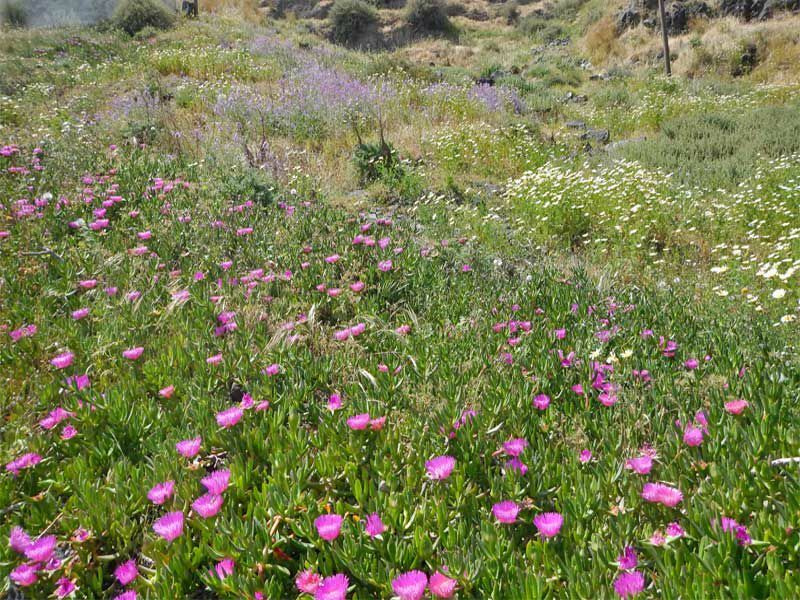 Other than that, Firostefani is offered for relaxing promenades on the edge of the caldera. 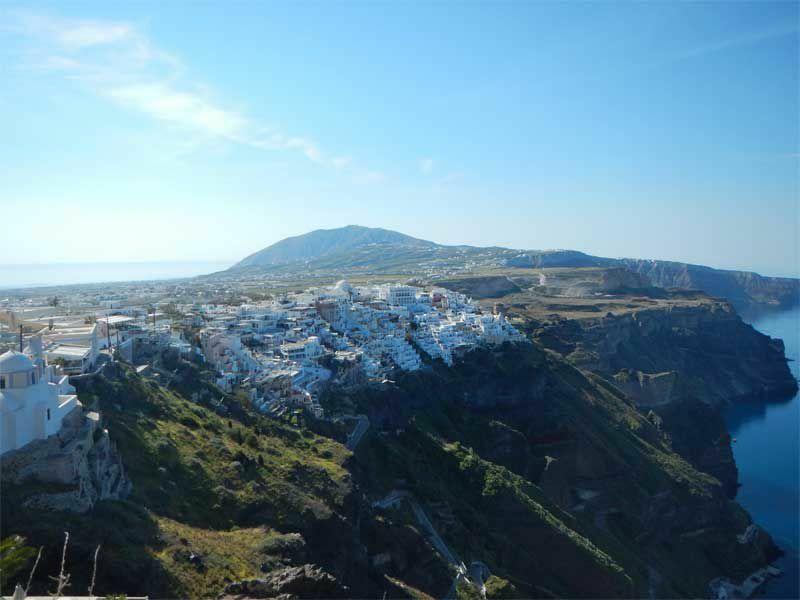 Further away, you will find lovely Imerovigli with its cubic-whitewashed houses built right on the rim of the caldera. Renowned for its beautiful views of the volcano, Imerovigli will offer you moments of ultimate romance. It is worth stating that Imerovigli has been declared as a traditional settlement from the State of Greece. Skaros, the wild cape of Imerovigli with the ruins of the castle that used to guard the western entrance of Santorini from pirate invasions, is perhaps the best spot to catch the sun before setting. 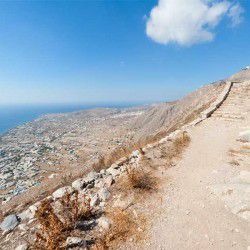 Set on the highest spot of the caldera, it is definite that you should follow the trail descending from the chapel of Agios Georgios to the cape of Skaros and the chapel of Panagia Theoskepasti for a unique caldera view. Oia, the shining star of Santorini, is the protagonist of the show hanging over the cliffs on the edge of the end of the caldera. 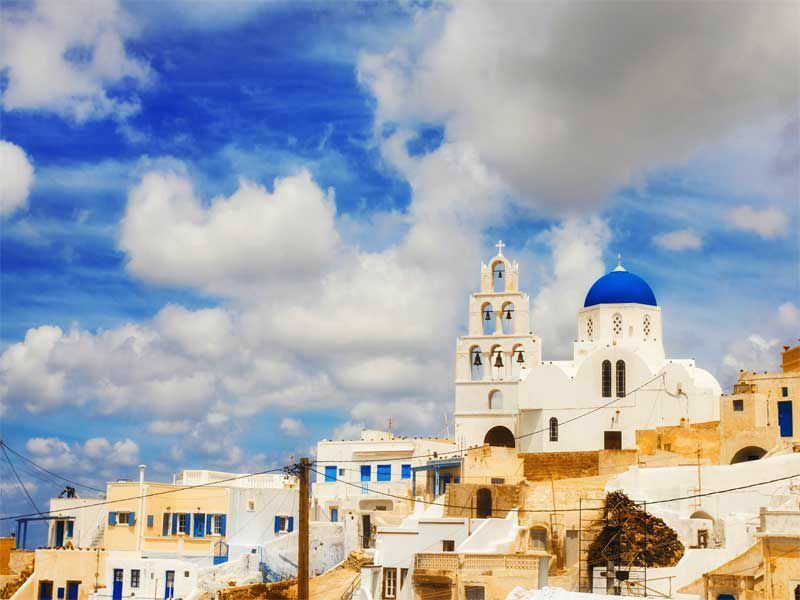 Worldwide known for its stunning sunsets, Oia’s atmosphere challenges the most spiritual souls. 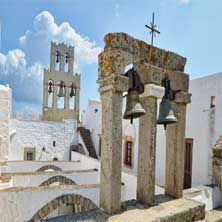 Whitewashed houses carved into the rock, imposing blue-domed churches, narrow cobblestone alleys and striking captain houses beautify one of the most beautiful villages of the Cyclades. It is worth stating that Oia has been characterized as a traditional settlement from the Presidential Decree of the State of Greece! The two-storey captain houses on the highest spot of the village serve as a reminder of Oia’s prosperity on its merchant fleet during the 19th and 20th centuries. 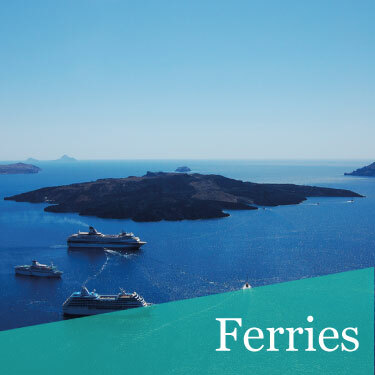 Places worth visiting include the Maritime Museum of Santorini with an interesting collection from the rich naval tradition of the island as well as the vestiges of the Venetian fortress of Agios Nikolaos for its spectacular sunset views. Undeniably, you should also visit the charming bay of Ammoudi. Conquered from the reddish rocks, it is a must to enjoy fresh fish in one of its excellent traditional taverns. From Ammoudi, you might even catch a boat to visit forgotten Thirassia! 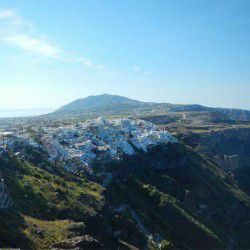 Perhaps one of the most traditional villages of Santorini, Megalohori nestles on the hinterland of the island over a hill of the western side. 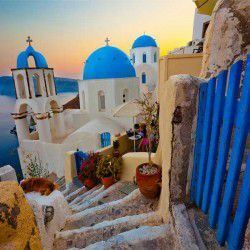 Cycladic whitewashed houses, blue-domed churches and cobblestone narrow alleys attest the strong traditional character of Santorini. 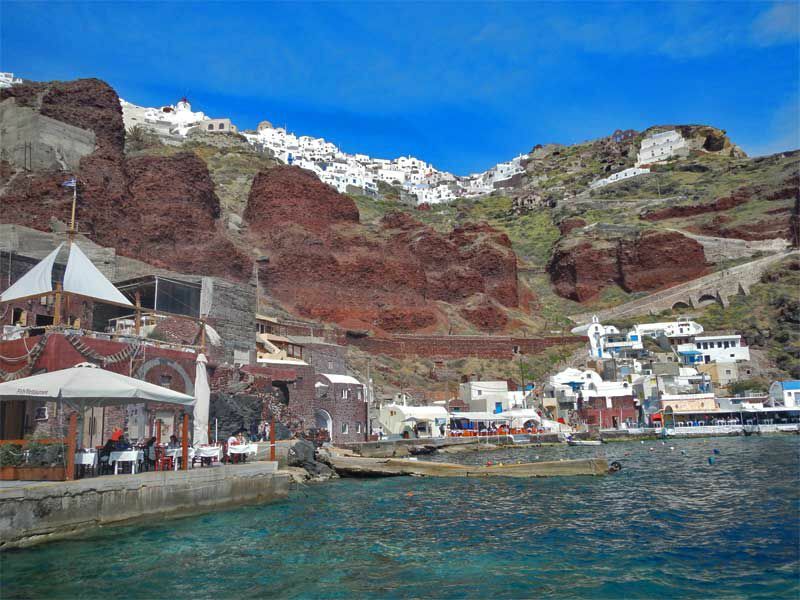 Lovely Megalohori is an ideal place for those looking to escape from the crowds and explore the other unseen face of Santorini. It is one of the prettiest and quietest villages of this island worth visiting for its charismatic allure. A charming bell tower archway frames the entrance of Megalohori just before the maze of the narrow alleys start. Let yourself get lost! Here, you can also find your own secluded sunset spot! 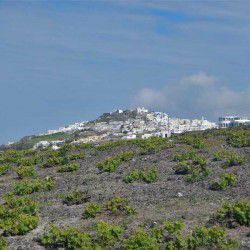 And since Megalohori is the heart of the wine industry of Santorini, as vineyards extend beyond the countryside, make sure you visit a winery! 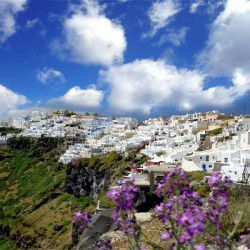 Built on the highest point of Santorini, the village of Pyrgos offers panoramic views of the entire island of Santorini all the way up to Oia. Pyrgos was once the capital Santorini following the abandonment of Skaros castle. Distinguished for its fortified architecture, Pyrgos will surpass your expectations. 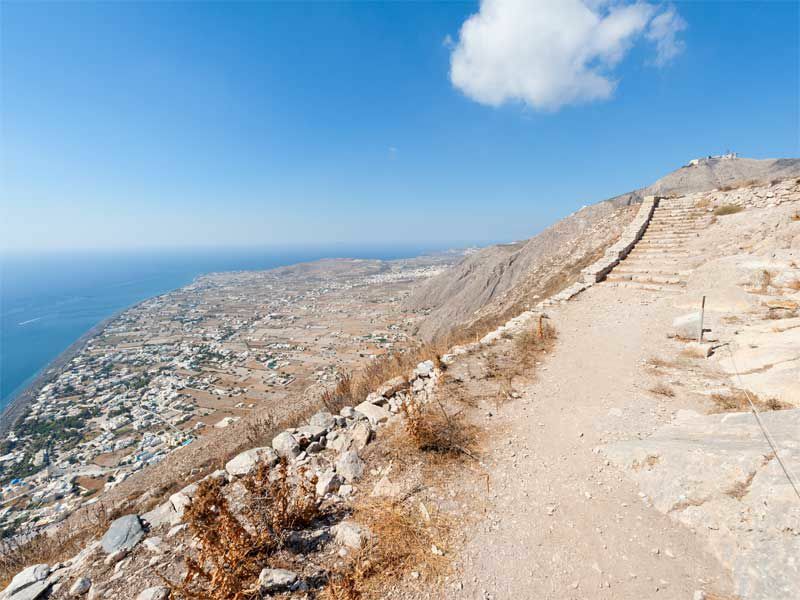 Kasteli Castle dominates the highest spot of Pyrgos offering spectacular views. This village has an authentic atmosphere with specimens of traditional architecture, remnants of neoclassical mansions and narrow cobblestone alleys. Of course, its magical spirit is the breathtaking sunsets! Also, make sure to pay your visits to the monastery of Prophet Elias. If you happen to visit Santorini in Easter time, make sure to visit Pyrgos as the entire hillside is lit up with burning fire brands; a wonderful spectacle! Undeniably, Santorini thrills the souls of the world. It’s a wonder, a natural wonder, created from one of the most catastrophic events in recorded history, and continues to fascinate even the most creative minds every single day. 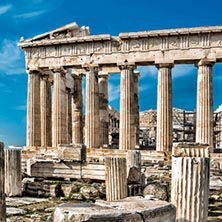 From historical monuments of great importance and impregnable castles dominating the islands’ peaks to glorious churches with magnificent blue domes and interesting galleries with rich collections, Santorini will surprise you with its unrevealed mysteries. On this arc of the Aegean Sea, Santorini has so much to offer. 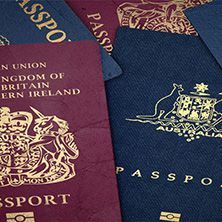 It’s not just the stunning sunsets, the picturesque villages and the volcanic sceneries. 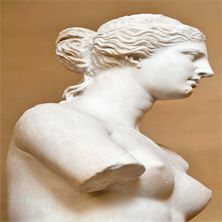 It’s the authenticity of hers, the exceptional identity of this Cycladic Island that makes it so distinctive and unique. Although you might think that summer is the best period to visit Santorini, Mysterious Greece can prove you wrong. 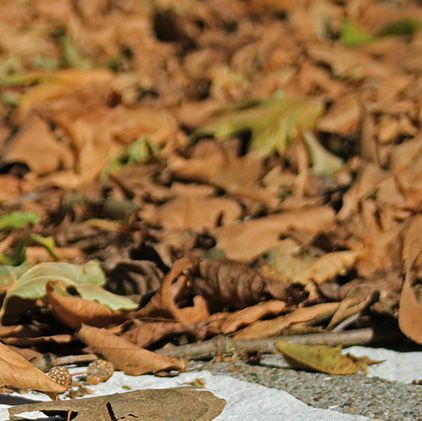 What about the cold windy nights of the winter, the sunny days of the verdurous sceneries of spring and the goldish colours of autumn? Take the chance to think outside of the box. 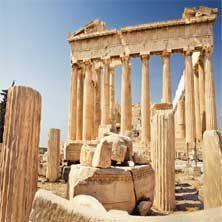 Its spirit will travel you to other mythical times while its beauty will make you think that the Olympian Gods did not live on Olympus Mountain. Intoxicating, mysterious, lunar, evocative, sensational, volcanic, and wondrous; this is Santorini. Will you let her seduce you in her own distinctive way? Submit your details to enter the competition for winning 2 round trip tickets to Santorini and 2 tickets for the volcano tour! 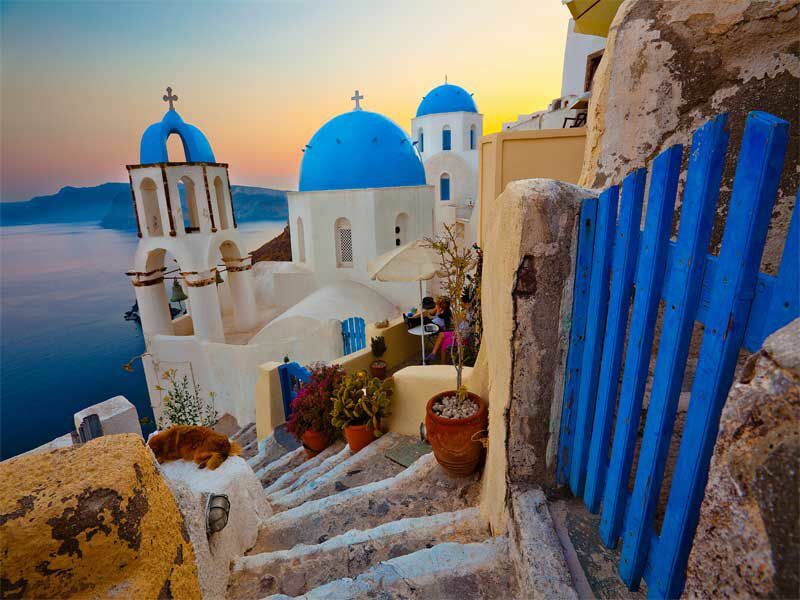 Unveil the mysteries of Santorini from the travel guides of Mysterious Greece!